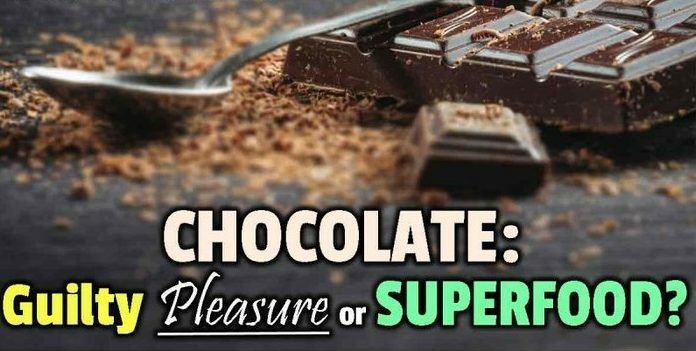 Is Chocolate a Guilty Pleasure or a Superfood? You are here: Home / Health & Wellness / Is Chocolate a Guilty Pleasure or a Superfood? The first solid chocolate bar was made from cocoa butter, cocoa powder and sugar. It was introduced by the British chocolate company J.S. Fry & Sons in 1847, but the history of chocolate goes back at least 4,000 years! Pre-Olmec cultures in Mexico produced chocolate as early as 1900 B.C. Originally, it was consumed as a bitter beverage. The cacao beans were fermented, roasted, and then ground into a paste that was mixed with water and spices and sweetened with honey. During the 14th century, the Aztecs and Mayans even used cacao beans as currency. The Olmecs, Mayans and Aztecs valued cacao for its mood enhancing and aphrodisiac properties and it was typically reserved for the ruling class. In the 17th century, cocoa and chocolate were considered potential medicine. Historical documents in Europe reveal they were used to treat angina and heart pain. Raw cacao is the gold standard when you talk about the health benefits of chocolate. It is actually quite bitter and not sweet, which is due to the nearly 400 bitter polyphenols that are present. When we’re referring to the health benefits of various chocolates, raw cacao has no equal. Unfortunately, the vast majority of the chocolate consumed, is in the form of milk chocolate, which contains very minute amounts of healthy cacao and loads of sugar. The milk added to milk chocolate can also interfere with your body’s ability to absorb the beneficial antioxidant polyphenols that are in the chocolate. To counteract the bitterness, most chocolate is sweetened. It’s a matter of balancing nutritional benefit with palatability. For health benefits, choose chocolate with a cacao percentage of about 70 or higher. The phenolic content of cocoa also varies depending on its origin. For example, Costa Rican cocoa contains more than 16.5 mg of catechins per gram, whereas Jamaican cocoa contains less than 2.7 mg per gram. Cacao: Refers to the plant, a small evergreen tree of the species obroma cacao and its dried seeds, also known as cacao beans or cocoa beans, prior to processing. If you’re after health benefits, raw cacao nibs are what you’re looking for. Ideally, buy them whole and grind them yourself in a coffee grinder, when using it in recipes. You can eat them whole, just like you’d eat conventional chocolate chips, but they are bitter. A healthy amount would probably be around a half to one ounce per day. Cocoa: Refers to the roasted cacao, ground into a powder from which most of the fat has been removed. Cocoa Butter: The fat component of the cacao seed. Chocolate: The solid food or candy made from a preparation of roasted cacao seeds. If the cacao seeds are not roasted, then you have “raw chocolate”. Since cacao is bitter, manufacturers often remove the polyphenols, which are responsible for many of chocolate’s health benefits. “White chocolate” contains no cocoa at all; it’s just a health-zapping mix of pasteurized milk and sugar. One 2012 meta-analysis found that eating chocolate could slash your risk of cardiovascular disease by 37% and your stroke risk by 29%. Another meta-analysis found that cocoa/chocolate lowered insulin resistance, reduced blood pressure, increased blood vessel elasticity and slightly reduced LDL cholesterol. According to a paper published in the journal Oxidative Medicine and Cellular Longevity, cocoa polyphenols may have specific benefits for cardiovascular and inflammatory diseases, metabolic disorders and cancer prevention. The paper further stated that these polyphenols also have antiproliferative, antimutagenic and chemoprotective effects, in addition to their anticariogenic effects. A 2013 paper in the Netherlands Journal of Medicine also reviews the many health benefits of cacao, noting that many consider it a “complete food,” as it contains; healthy fats, antioxidants, proteins, minerals and valeric acid, which acts as a stress reducer despite the presence of stimulants.